Miami Trace junior Aubrey McCoy (5) makes a pass from the foul line during a Frontier Athletic Conference game in the Panther Pit against Chillicothe Wednesday, Jan. 23, 2019. Pictured for Chillicothe are (l-r); senior Hayden Price (23) and junior Makenzie Greene (3). 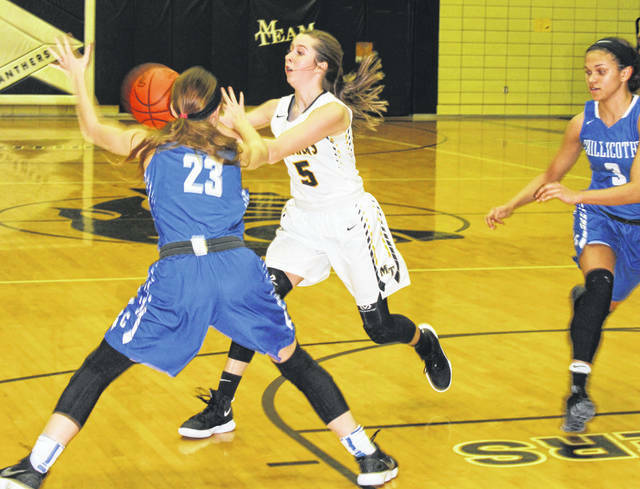 It was the penultimate girls varsity basketball game in the Panther Pit Wednesday night as the Lady Panthers welcomed the Lady Cavaliers of Chillicothe High School for a Frontier Athletic Conference match-up. After a slow start for both teams, Miami Trace ignited with a huge second quarter en route to a 60-28 victory. The teams were tied, 6-6 at the end of the first quarter. The Lady Panthers exploded for 26 points in the second quarter to take a 32-17 halftime lead. The third quarter was another good one for Miami Trace, as they scored 19 points to seven for the Cavs to extend their lead to 51-24. Miami Trace got all of their available players into the game in the fourth quarter as they rolled to the victory. Thirteen different players took part for Miami Trace. Miami Trace junior Shay McDonald was the game’s leading scorer with 15 points. She was one of five different players to hit at least one three-point field goal. McDonald also led the team with five steals. Senior Cassidy Lovett scored 14 points (including one three) and led her team with five rebounds and four assists. Senior Tori Evans scored eight points (with one three); sophomore Magarah Bloom scored seven points (she hit one three) and senior Becca Ratliff hit two threes for six points. Chillicothe (4-12 overall, 2-5 in the FAC) was led by a trio of players — senior Meliah Johnson and juniors Shawnice Smith and Alysia Cunningham — each with seven points. It was a tough shooting night for Chillicothe as they made 8 of 39 shots for 21 percent. Chillicothe was 1 of 18 from behind the three-point line for 6 percent. They had 26 turnovers. Miami Trace connected on 23 of 50 shot attempts for 46 percent. The Lady Panthers were 6 of 16 from three-point range for 38 percent and they committed 17 turnovers. “We were able to force some turnovers out front,” Miami Trace head coach Ben Ackley said. “We were very lethargic, I thought, in the first three or four minutes. We got better as the game went on. “It’s always tough to play on back-to-back nights,” Ackley said. “Chillicothe always plays us very tough. They’re very athletic and physical. They gave us some issues early, but we adjusted. Once we saw the ball go in a couple of times, our pressure turned up on defense and that turned into some easy baskets. “It was really good to get our kids some playing time,” Ackley said. “We saw a lot of different kids contribute. Cass scored the ball very well tonight. She continues to play her best basketball of the year right now. Olivia Wolffe did a very good job guarding Shawnice Smith. “Overall, we’re just glad to get out of here with a win,” Ackley said. Miami Trace (10-6 overall, 4-2 in the FAC) will play at Hillsboro Saturday at 5:30 p.m. The final girls game in the Panther Pit is slated for Monday, another make-up game, this one with the McClain Lady Tigers, who are currently in second place in the FAC. The j-v game starts Monday at 5:30 p.m. If you want to see a girls game in the Panther Pit, this will be the last one. MIAMI TRACE — Olivia Wolffe 0-2-2; Cassidy Lovett 4 (1)-3-14; Becca Ratliff 0 (2)-0-6; Aubrey McCoy 1-1-3; Shay McDonald 6 (1)-0-15; Tori Evans 2 (1)-1-8; Mararah Bloom 2 (1)-0-7; Libby Aleshire 0-0-0; Reagan Barton 0-0-0; Aubrey Wood 1-0-2; Gracee Stewart 1-1-3; Emma Pitstick 0-0-0; Lena Steele 0-0-0. TOTALS — 17 (6)-8-60. Free throw shooting: 8 of 15 for 53 percent. Three-point field goals: Ratliff, 2; Lovett, McDonald, Evans, Bloom. Field goal shooting: 23 of 50 for 46 percent. Three-point field goal shooting: 6 of 16 for 38 percent. Turnovers: 17. Rebounds: 27 (6 offensive). Assists: 9. Steals: 18. Fouls: 17. CHILLICOTHE — Zoe Ford 0-0-0; Mackenzie Greene 1-0-2; Julia Hall 0-0-0; Emma Barnes 1-1-3; Emma Ward 0-0-0; Aries Barnes 0-0-0; Alysica Cunningham 0 (1)-4-7; Shawnice Smith 3-1-7; Hayden Price 1-0-2; Meliah Johnson 1-5-7; Taylor Simmons 0-0-0. TOTALS — 7 (1)-11-28. Free throw shooting: 11 of 21 for 52 percent. Three-point field goal: Cunningham. Field goal shooting: 8 of 39 for 21 percent. Three-point field goal shooting: 1 of 18 for 6 percent. Turnovers: 26. Offensive rebounds: 8.